“E” plate “FARE STAGE” plates were replaced by vertical red plates, approximately 40 cm x 8 cm (153⁄4" x 31⁄8") affixed to the bus stop poles adjacent to the stop flag. 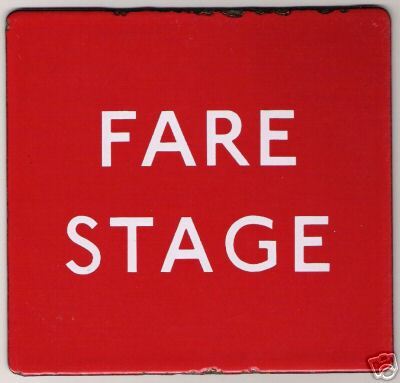 These “FARE STAGE” plates were a new way of showing fare stages at bus stops. 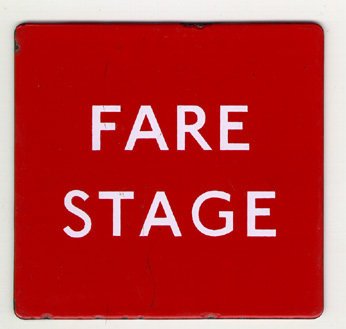 Fare stages were the points from which a new fare was calculated. They previously had been shown by means of a small circular black disc near the top of the post. 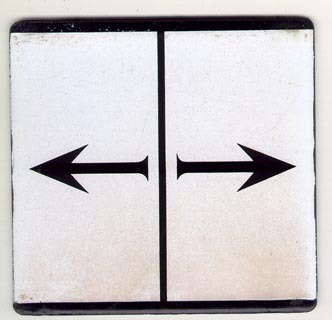 In a few cases, such as on bus shelters or in bus stations, there was not a suitable pole and an “E” plate was used instead, sometimes placed in runners on top of the shelter. It was a short-lived method, and was subsequently changed to a tall vertical red strip, the depth of the bus stop flag, attached between the post and the flag. Red “E” plates are not easily found nowadays. 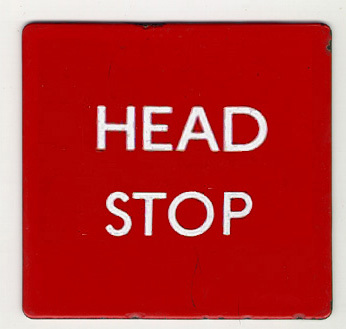 A head stop sign was used to indicate to bus drivers of crew operated (rear entrance) vehicles that they should stop with the frontor “head”of the bus at the bus stop post. They were needed in cases where just forward of the stop there might have been a driveway or some such which was not to be obstructed by a stopped bus, or the bus stop post could not be located in the normal position for some reason. 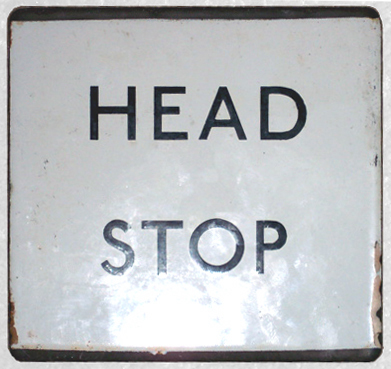 Head stop signs became more common when one-person-operated buses were being introduced, and shared stops with conventional rear entrance buses. (If there was only a rear entrance bus serving the stop, the bus stop post would normally have been moved further back about 10 meters (30 feet) so the bus could stop in the correct position.) 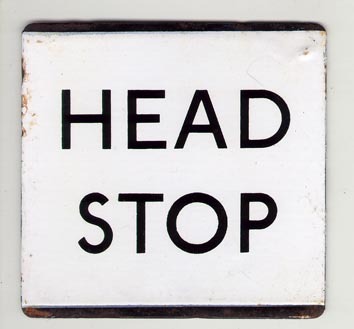 Sometimes the sign was on a red G3 “Q” plate the width of the stop flag, but where there were a number of routes stopping and space was tight, the message was placed on a conventional “E” plate. 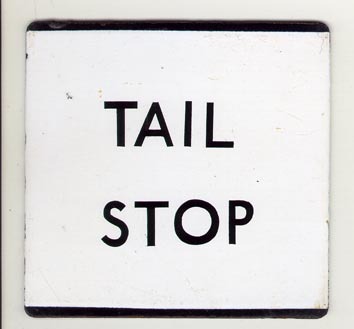 Similarly, there were also tail stop signs. The latter were quite unusual. 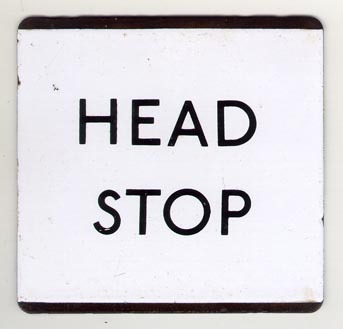 Head stop “E” plates normally had black letters on a white background. The black head stop versions came in at least three sizes of lettering, and this one has the top line 75mm (3") wide. 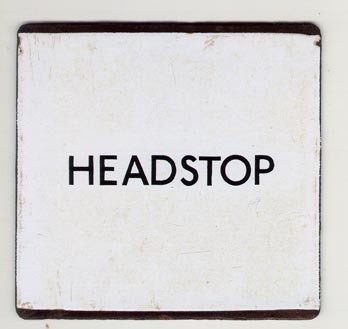 This head stop plate has larger letters and the top line is 95mm (3¾") wide. This is the one-line version, with the smallest lettering. 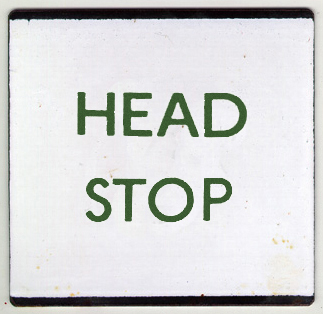 Occasionally green lettering was used for head stop “E” plates. I don’t know if they were made to match green Country Area stops. A white on red plate similar to this one was spotted on the internet, but was probably experimental. Tail stop “E” plates are rather uncommon, and in that case it was to tell the driver of an opo bus to pull forward and stop with their rear (or “tail” of the bus) at the bus stop. It was more usual for the bus stop post to be moved to a more conventional position on the pavement, and avoid the queue of intending passengers having to turn round and walk to the front of the bus. 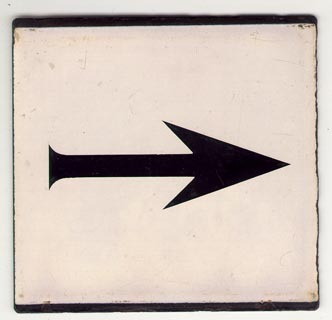 “E” plates showing arrows were used on top of aluminium bus shelters to show whether people should queue to the left or rightor in the case of double arrows, in two separate queues. How successful they were is unknown, it is not believed they were common, and were most likely to have been used in bus stations in the country area. They are now exceptionally rare.